We didn’t take full advantage of the holiday weekend…working on the house-wise. Rather, we cut it a bit short as I have some minor motorcycle repairs to do before my run to Michigan in about 7 days…minor repairs like a new tire, some new oil…maybe some sparkers and an air-filter…that and replacement or repair of some rather seriously damaged structural fender panels…ya know…details. Anyway, Monday for that…another story yada yada…I’ll post those pics over here. One of our tasks this weekend was some cleanup on our commercial building on the square. We’ve literally hauled tons of junk out of there…at least as much more still remains. We were working on the mezzanine, which is a half floor at the back of the building between the first and second floor. Ours measures about 25′ x 20′. It was previously used for storage and also hosted a gift wrapping station. The problem with this extra, bonus 500 square feet of space is that it was packed…floor to ceiling and wall to wall…with junk. We’ve worked several days cleaning it out. There are cash-registers from the last 30 years (maybe 12 of ’em), typewriters of all ages (from the old royal portable manual to several electric models), at least 5 adding machines, dead computers, cases of flash-bulbs (yes, real flash-bulbs), and about 5000 boxes of packing material, old computer labels (heavy! ), green-stamp machines, postage stamp machines, an ancient copier, and heaven only knows what else…I’ve mentioned that this building was a pharmacy and doctors’ offices since it was built in 1896 or so…a little imagination about the tools and times can generate nightmares. Remind me to tell you about the spreaders…(shudder). All this is leading up to this…We were done with the mezzanine. Everything was cleaned out. All that was left were the shelves, and all we needed to do was sweep the place up and turn out the lights. And then I poked my nose into a nook…or perhaps it’s a cranny. The stairs that go to the second floor have a landing. The landing is over a corner of the mezzanine and the space was covered by what I thought was a wall underneath. It turned out to be an old table/desk thing turned sideways and shoved underneath. There was a reasonably large space underneath…perhaps 4′ x 6′ and maybe 4′ high. Is that a nook? Or a cranny? The space was more than half filled with paint. Lots of paint. 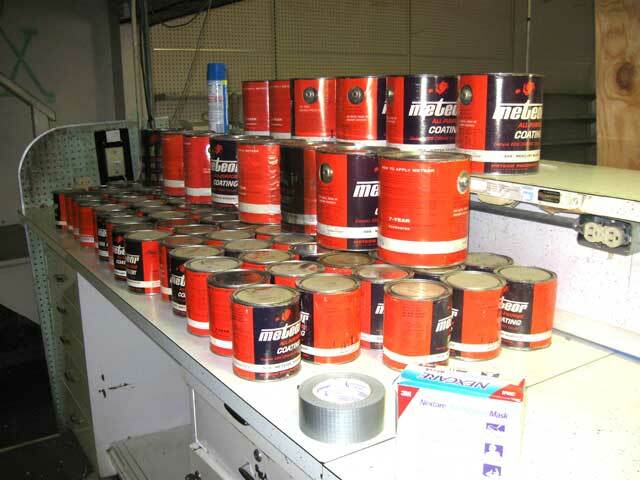 Cans upon cans of paint. Probably 500 pounds of paint…in mostly quart cans. Paint so old the cardboard boxes have rotted around it. More than a hundred cans of it. What I SHOULD have done….was shoved the desk/thing back in, and then nailed a piece of plywood over it, painted it to look like the surrounding walls, and just forgot about it. The next owner could worry it…well, perhaps it would be me…after the cans started leaking and paint seeped into the downstairs. What I did was crawl in and hand it all out to the wife, and then we passed it down the stairs, and now we’ll find a proper way of disposing of it. There’s something more than 40 gallons here. It has such color names as “meteor black”, “(something weird) orange” and “pasty blue” or such. It’s alkyd based, high-build, glossy, and contains “dow corning silicone”. We’re guessing by the condition of the cardboard (and the amount of dust) that it’s 10-15 years or more old. Perhaps 20 plus. So let’s see…if a gallon can cover 300 square feet then 40 gallons…divide by two, carry the three, multiply by pi…well…what, 12,000 square feet? A wall 10 feet high by 1000 feet long (we’d spill a bit)? Oh, and why the “part one”? What could possibly be “part two”? Glad you asked. It’s an interesting question…could be several interesting questions actually…this nook in part deux is over 6 feet tall…but it really boils down to one VERY interesting one. What you call junk,I call fascinating. Get Geraldo for part two. 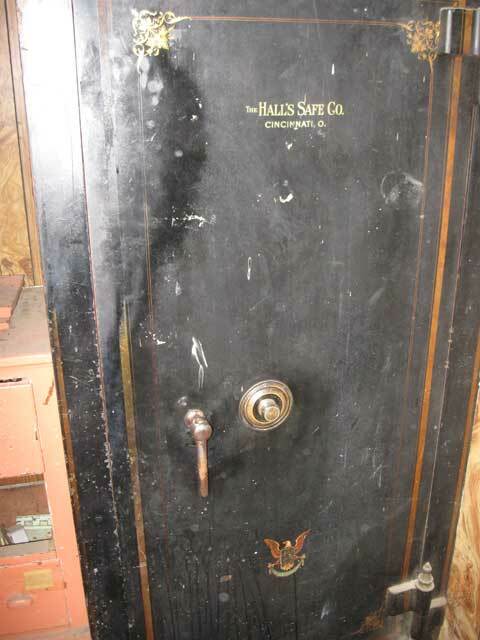 That might be Al Capone’s REAL vault!